"You couldn't relive your life, skipping the awful parts, without losing what made it worthwhile. You had to accept it as a whole--like the world, or the person you loved." 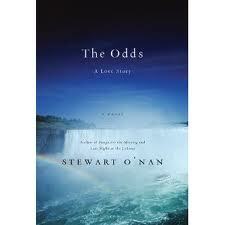 Stewart O'Nan is always a pleasure to read because he creates characters that feel fully realized. Their interests, flaws, motivations, etc. are fully fleshed out on the page and as a reader you feel intimately acquainted with them by the end of the story. I was looking forward to his new book, The Odds which is really more of a novella, because I knew it wouldn't let me down. And it didn't! It was everything I've come to expect from Stewart O'Nan. It hits pretty close to home for the troubled times, Art and Marion are a couple who have been married for nearly thirty years and due to a series of disastrous financial decisions, mostly relating to their house, they are going to Niagara Falls for one last weekend away, in which they will gamble all they have left in a desperate attempt to get the money they need. They don't really expect to win, though, it's more of a decision made to ensure their actual plans of filing for bankruptcy and divorcing. But it's not just their finances that are in ruins, their marriage is as well. They are both going into the weekend in different ways...Marion is looking at is a good-bye, while Art hopes to make some real memories and share some special times. Their marriage has problems for legitimate reasons and those become apparent as the story progresses. At first, you just know certain things happened and those things were big and destructive. But as Marion and Art come into sharper focus, so do their pasts. And the way each is dealt with is representative of who they are, Art cheated and it was something that impacted them both, information they shared and tried to deal with. Marion cheated later, and she keeps is a secret out of obligation. Art's destroys them on the surface, but Marion's wreaks its own damage underneath the exterior. The setting of Niagara Falls was interesting. I have never been there. Now, I never want to go. It sounds like Vegas except with pretty waterfalls. But in this gaudy over the top place, Marion and Art come to learn new things about each other as they gamble away their savings and make one last ditch effort to save themselves. Each chapter begins with an odd, but you know the biggest thing at stake is Art and Marion and their relationship.